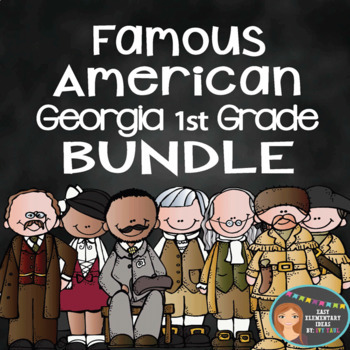 This is a bundle of over 420 pages and slides to help you teach Georgia's Famous Americans for first graders. Save by purchasing the bundle! 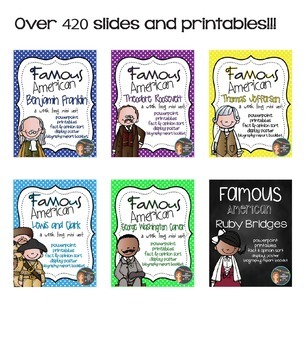 Bundle includes Famous Americans Lewis and Clark, Thomas Jefferson, Theodore Roosevelt, Ruby Bridges, George Washington Carver, and Benjamin Franklin. There is a PowerPoint and PDF for each Famous American. 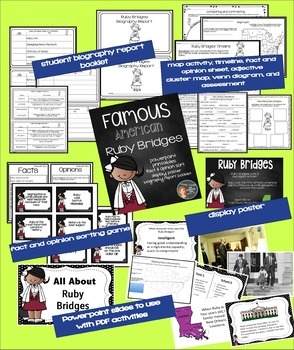 In every unit, students will compare and contrast their life to the Famous American, cut & paste timeline activity, describe the person using character traits, write a mini biography report, and more! Each unit is created to last about a week. Check out the individual previews linked at the bottom of the page. If you have any questions, please don't hesitate to ask before purchasing. What locations are significant to _____________? What character traits describe _____________? *This is a zipped file. 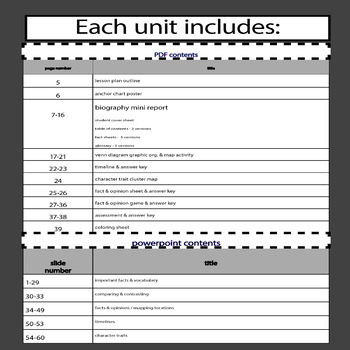 Purchase allows use in a single classroom only. Additional licenses are available for a discounted price. Check out Lewis and Clark! Check out George Washington Carver! I've had so much fun creating these units! I hope they are helpful to you. Become a follower of my store for monthly specials!